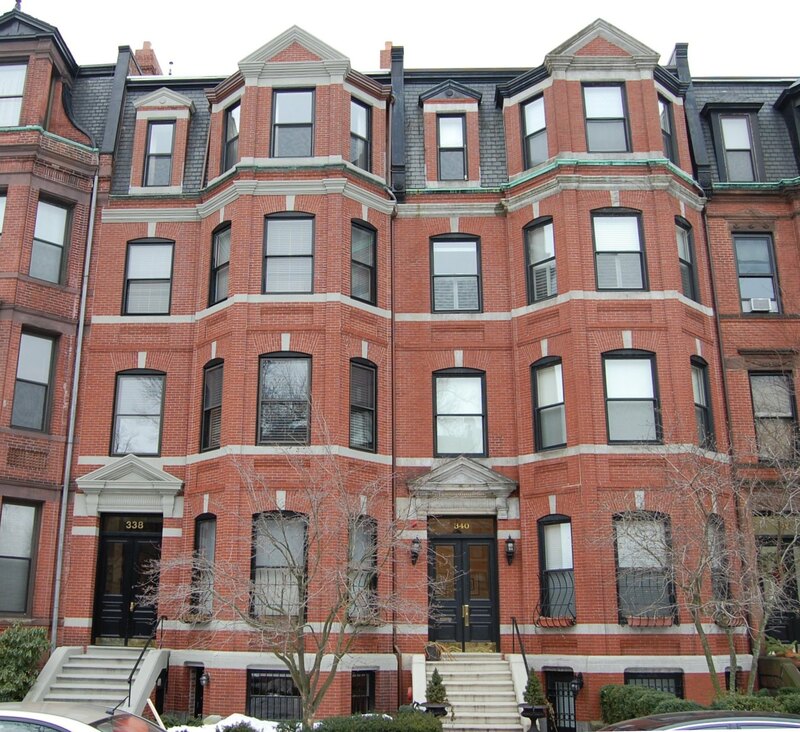 340 Commonwealth is located on the south side of Commonwealth, between Hereford and Massachusetts Avenue, with 338 Commonwealth to the east and 342 Commonwealth to the west. 340 Commonwealth was designed by Bradlee, Winslow, and Wetherell, architects, and built 1882-1883 by Vinal & Dodge, masons, for building contractor George Wheatland, Jr., for speculative sale. He is shown as the owner on the original building permit application, dated September 20, 1882. The house was originally numbered 338 Commonwealth until about 1889, when 328 Commonwealth was built and the houses to the west of it were renumbered. 340 Commonwealth was one of thirteen houses (336-360 Commonwealth) built for George Wheatland, Jr., by Warren D. Vinal and Charles A. Dodge on land owned by Charles Merriam and by Jacob Rogers. 336 Commonwealth was designed by George Avery, 338-340 Commonwealth were designed by Bradlee, Winslow, and Wetherell, and 342-360 Commonwealth were designed by Obed F. Smith. 336-338 Commonwealth were built first, in 1881-1883, on Charles Merriam’s land. On December 10, 1881, after 336 Commonwealth was completed, Charles Merriam sold George Wheatland, Jr., the house and land, together with the remainder of his land to the west. On the same day, George Wheatland, Jr., sold 336 Commonwealth and the 24 foot lot at 338 Commonwealth to Warren Vinal and Charles Dodge. He retained the two feet the west. Warren Vinal and Charles Dodge sold 336 Commonwealth in June of 1882, and sold 338 Commonwealth back to George Wheatland, Jr., in July of 1883, after it was completed. 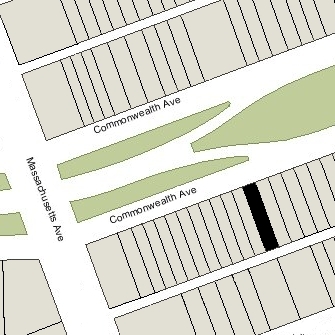 Click here for an index to the deeds for 340 Commonwealth, and click here for further information on the land on the south side of Commonwealth between Hereford and Massachusetts Avenue. On May 5, 1883, Jacob Rogers sold George Wheatland, Jr., the eastern 22 feet of his land. 340 Commonwealth was built on it and the two feet to the east George Wheatland, Jr., had retained from his purchase from Charles Merriam. On October 31, 1883, 340 Commonwealth was purchased from George Wheatland, Jr., by Arolyne P. (Leavitt) Damon, the wife of George L. Damon, a manufacturer of safes. They previously had lived in Somerville. Arolyne Damon’s mother, Margery Lowell (Record) Leavitt, the widow of Nehemiah Leavitt, lived with them. 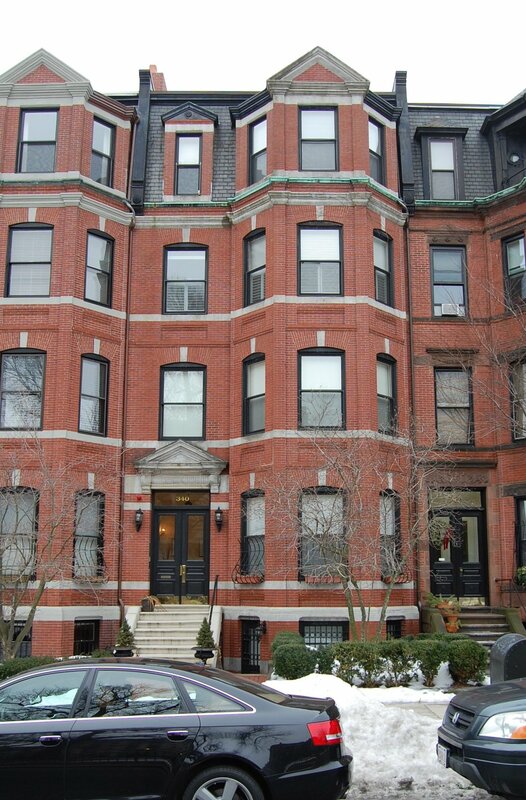 The Damons and Mrs. Leavitt continued to at 340 Commonwealth during the 1887-1888 season, but moved thereafter to the Coolidge House hotel in Bowdoin Square. On March 10, 1888, 335 Commonwealth was purchased by Miss Agnes Fairbanks. She lived in St. Johnsbury, Vermont, with her mother, Mary Elizabeth (Taylor) Fairbanks, the widow of former Vermont Governor Horace Fairbanks. Agnes Fairbanks married in September of 1888 to Ashton Rollins Willard. After their marriage, they lived at 340 Commonwealth. He was a lawyer and art historian, author of several books on Italian art. 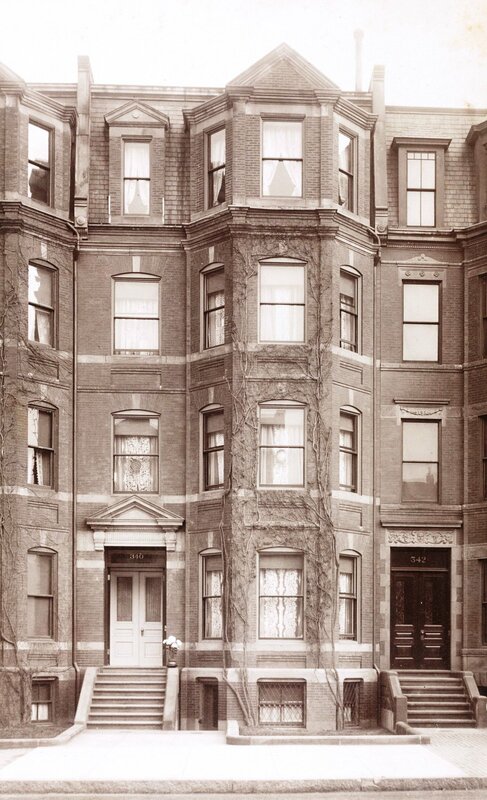 They continued to live at 340 Commonwealth during the 1902-1903 winter season, but moved soon thereafter to a new home they had built at 43 Commonwealth. On May 20, 1904, 340 Commonwealth was purchased from Agnes Willard by Lucy Ada (Howes) Dowse, the wife of wholesale hardware merchant Charles Francis Dowse. They previously had lived at 347 Marlborough. They also maintained a home in Duxbury. Lucy Dowse died in November of 1915. Charles Dowse continued to live at 340 Commonwealth. By the 1915-1916 winter season, he had been joined at 340 Commonwealth by his son-in-law and daughter, Carleton Sprague Gifford and Raymah (Dowse) Gifford. They previously had lived at 18½ Autumn in the Fenway. Charles Dowse died in February of 1931. 340 Commonwealth was inherited by Charles and Lucy Dowse’s two children: Raymah (Dowse) Gifford and Granton Hall Dowse. 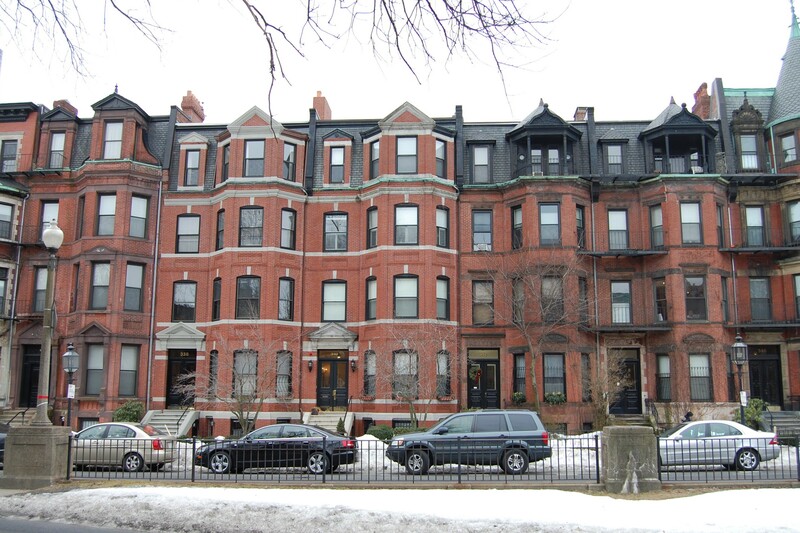 Carleton and Raymah Gifford continued to live at 340 Commonwealth and to maintain a home in Duxbury. He was purchasing agent for the Provident Institution for Savings. Granton Dowse and his wife, Juliette (Huntress) Dowse, lived in Weston. He was an insurance broker. He died in April of 1940. Carleton Gifford died in September of 1945 and Raymah Gifford continued to live at 340 Commonwealth. Their daughter, Rosamond, lived with her. Raymah Gifford died in October of 1971. Rosamond Gifford continued to live at 340 Commonwealth until her death in July of 1997. On April 9, 1998, 340 Commonwealth was purchased from Rosamond Gifford’s estate and the estate and heirs of Granton Dowse by Clarendon Associates LLC (Harold Brown, manager). In September of 1998, it applied for (and subsequently received) permission to convert the property from a single-family dwelling into four units. On August 6, 1999, Clarendon Associates converted the property into four condominium units, the 340 Commonwealth Condominium.